And this was a rather amazing possibility. Even Yngwie, who is famously unconcerned with micromanaging the details of his picking technique, acknowledges that he uses a combination of alternate picking and sweeping to power his more intricate playing. But watching the nearly seamless transition from repeated pickstrokes to sweeping happen right there on the Austin City Limits tape — it was almost like watching dinosaurs learn how to fly. Early feathered lizards may have jumped off trees or cliffs to get airborne. At some point, generations later, they abandoned the concept of launching altogether and just began flapping right off the ground. If the bounce technique was the launch, then sweeping was the flap. For all the agglomeration of concepts in the now-famous Total Guitar “bounce technique” scene, it is amazing that all the key ingredients were indeed right there. 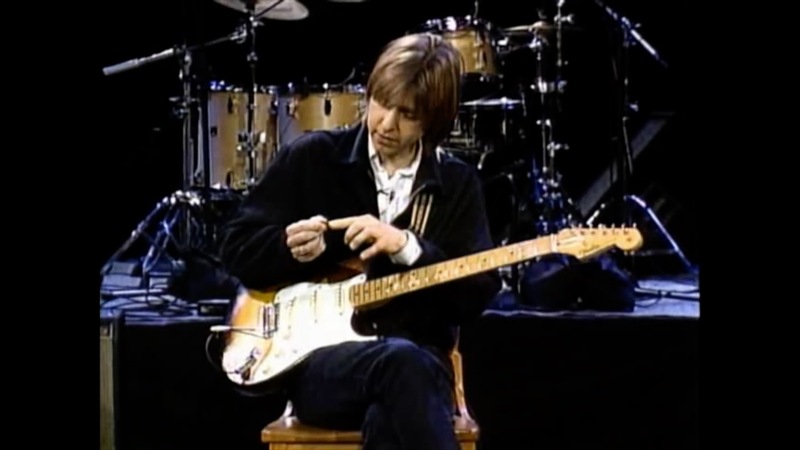 Inscrutable as it may have seemed to a generation of guitarists trying to parse his phrasing, here we had an elite player, on videotape, actually describing his use of downward pickslanting and the power of the upstroke string change. So let’s get this straight. His picking style, which he reminds us he has already described in the first video, is where he picks up, away from the pickguard. Yes, precisely — downward pickslanting. But he’s currently not free to use any old sequence of downstrokes and upstrokes, because his upstrokes go up, you see, and his downstrokes go sideways. Well, they really don’t — they’re downward pickslanting downstrokes, angled the same way as his upstrokes, just moving in the opposite direction. But we know what he means — he means they’re buried in the strings. But if he could make his downstrokes be like his upstrokes, so that they also went up, just in the opposite direction, then he could free himself from having to… to do what? To only switch strings after upstrokes, of course. If he could just figure out how to make those downstrokes not go what he perceives as sideways, then his downstrokes could also, just like his upstrokes, break free from the plane of the strings. And if he could do that, well, then he’d have figured out something he knows would be incredibly powerful and liberating: two-way pickslanting. Amazing. Here Eric is describing, in roundabout fashion but in unmistakable detail, the central limitation of any one-way pickslanting strategy, as well as its actual solution. He plays a demonstration of what two-way pickslanting might look like, with wide swinging downstrokes and wide swinging upstrokes that are essentially, stringhopping. This broadly mirrors the brute-force attempt that most players make when trying to solve this problem. So in other words, this isn’t going to work. And he knows it, because he then notes, again precisely, that he’s still working on the technique and that it’s not yet ready for prime time. You can practically see the gears turning. He’s not sure how to make it work, but he can tell that the swinging approach is not it. And that is the difference between genius and the rest of us. Eric got it — all of it — including the technique he had, and the technique he had yet to find. Had either of these two passages been stated with just a bit more clarity, the entire enterprise of picking technique could have been revolutionized in 1989.